Surprised that ODU was left out again. What has me more fired up, is the disrespect to only put one GMAC team in the playoffs. I felt that the GMAC did respectable outside of he conference. Unless I am missing something on the criteria, I thought for sure that either Tiffin or ODU would make it in, in addition to Hillsdale. No pressure but we really need Hillsdale to win a couple playoff games. So true. Absolutely no respect for the GMAC. I believe the Tiffin coach was on the committee. I would love to see the actual numbers used by the committee. There are 2 computer ranking websites who had ODU 4 an 5 in the region. ODU would be favored over 4 or 5 of the 7 teams that made it. I like our chances. Hillsdale still played really well at Indy coming off the emotion of winning the league the week before. One play on special teams was the real difference maker. It's time this league got the respect it deserves. Chargers need to go out and establish that. I would love to see the actual numbers used by the committee. Would also. Thought the Ashland win would help them against any other two loss school. The bottom of the GMAC probably is worse than the bottom of the PSAC west for CPU points. Fairmont State is also ranked 3rd in the region one in scoring offense & defense (39 and 18). That’s also 15th & 20th Nationally. Each conference needs to know this. Answer is appropriate in each forum. It's also incredibly flawed logic considering their only OOC game was a 2-8 Stonehill team. Not a criteria for consideration...and that is true in all of the other forums too. Go win this thing Chargers! This is just very disappointing for the seniors who played for ODU the last 2 years. There is no doubt that we could have competed for the regional championship the last year and this year and were not given that opportunity. Of the five 9-2 teams, Hillsdale had the best OWP and beat ODU, so they get #6. All good there. But then the MEC commissioner/NCAA Division II football chair said that of the remaining four teams, ODU had the best OWP, but lost to Tiffin. They couldn't put Tiffin in over ODU since Tiffin's OWP was bad. So rather than make a tough decision between those two schools, they just tossed them aside and chose between Slippery Rock and Fairmont. Cowardly. How many football scholarships does Hillsdale have? I just look at the fact that ODU was sitting at 8th or 9th going in to the weekend, granted they didn’t gain anything by who they played, but there was enough chaos ahead of them, that it seemed all-but certain that they would jump in, unless they kept Tiffin in. 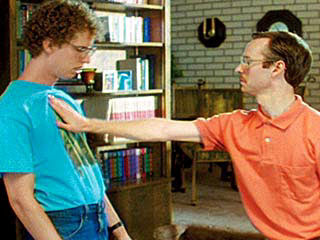 This is all of you slap fighting over who from SR1 is a contender! Is this legit? So the MEC commish tossed out two G-MAC teams from a conference that had more teams with a winning record than the MEC and NE-10 because they couldn't draw a reasonable conclusion? At the same time, he wanted his alma mater, the school where he coached and the school that he broadcasted games from to have a chance at a bid they didn't deserve? If true, he should be removed from any committees. Maybe the MEC commish didn't want the G-MAC, a conference that has been outdoing his conference lately, earning more bids than the league he runs.